CALGARY, Alberta, October 3, 2018 – Thanks to instructors adopting Lyryx with Open Texts (LOTs), more students are accessing free open source textbooks and affordable online homework. With subjects in Accounting, Economics, Mathematics, & Statistics, colleges and universities in Canada and the United States are adopting LOTs at a higher rate and to date have helped students save approximately $8 million. In 2013, a dozen leaders of open educational resource (OER) projects issued a challenge to the OER community to save students $1 billion by 2018. As a Canadian leader in the global OER movement, Lyryx Learning continuously strives to contribute to cost savings for students and eagerly submitted their OER enrollment data to this project. Lyryx will attend the Open Education Conference in Niagara Falls, NY, October 10-12, 2018, where the results of this challenge will be reported. Lyryx Learning is an open educational resources (OER) company based in Calgary, Alberta that began in the Mathematics Department at the University of Calgary. Lyryx was established in 2000 and is supporting instructors across Canada by sustaining OER and developing adaptable, accessible and affordable resources for higher education. 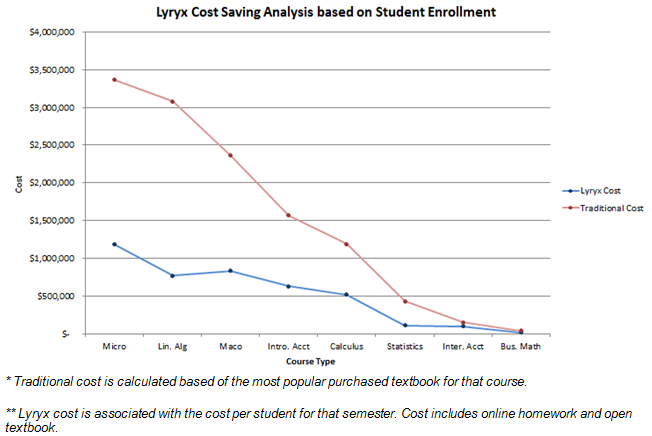 Lyryx provides quality OER and services including open texts, assessments, supplements and support in the subjects of Mathematics, Statistics, Accounting, and Economics.